Take a medium-sized mixing bowl out and mix the onion, lime juice, jalapeño and salt together in it. Let it sit for 10 minutes. Now add in the avocados, mashing to your own preferred consistency. Stir in the cilantro* and serve. *We initially forgot to add in the cilantro but even when we did remember to, we didn’t think the cilantro improved or hurt the flavor of the guacamole. 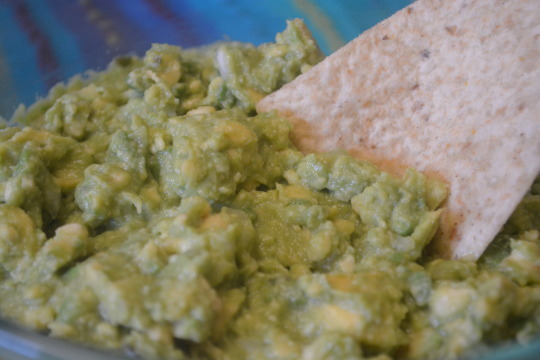 Even though we were skeptical of this recipe at first we decided to try it because I don’t care for the texture of tomato pieces and this was one of the few guacamole recipes that didn’t list tomatoes as an ingredient. All that being said, it didn’t seem like there was enough of the other ingredients besides the avocado to bring flavor to the guacamole. Boy were we wrong ! 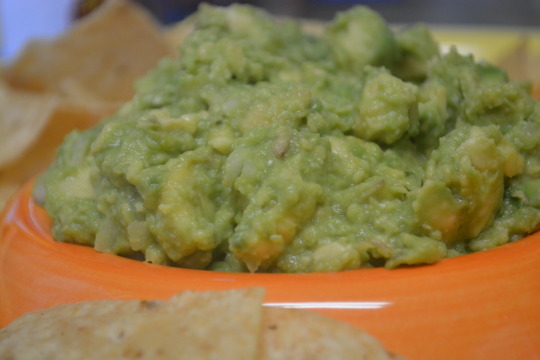 This ended up being one of the best guacamoles that we’ve ever had ! We didn’t pick up any heat from the jalapeños at all. For something so simple, it packs a lot of flavor !